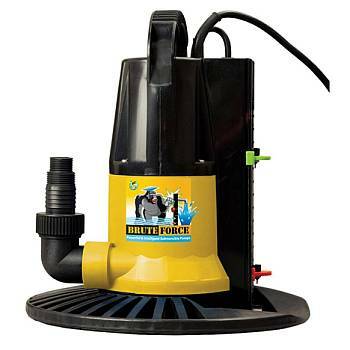 The Brute Force Swimming Pool Cover pump can pump water off of your pool cover down to 3/16". 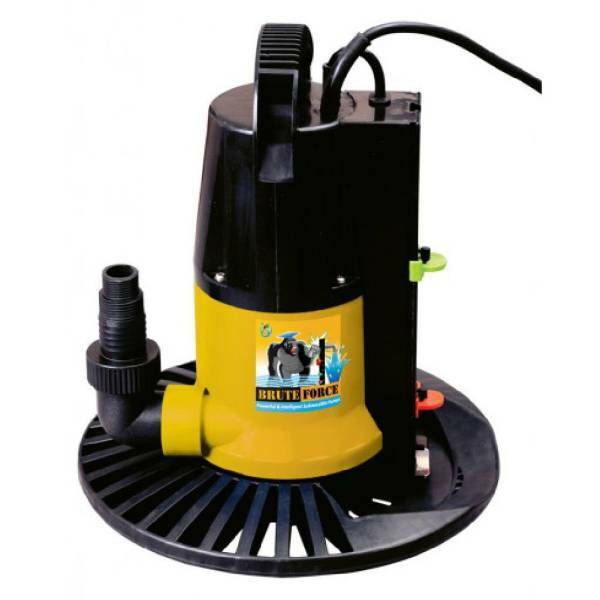 This cover pump is equipped with an adjustable "go flow" high water sensor that will automatically turn on once the internal sensor detects water at the level you selected. The pump will automatically turn off once the water level has gone below the selected height of the "no flow" setting you have selected. You should always select a higher lever for the go flow setting than the no flow setting which will keep the pump from running dry. Never set the 2 levels at the same level as this will also cause the pump to run dry. The pump is designed to be cooled by pumping fluid so never let the pump run dry. Great for use on all winter covers including solid safety covers. Comes complete with garden hose adapter and 32-ft. cord. 110-120V AC. UL listed. 1-Year Warranty. To give your Brute Force cover pump more stability on solid winter covers - add our universal, low profile pump base. Easy snap on design fits either of our Brute Force Cover Pumps.